Rhubarb is a rhizomatous perennial whose leafstalks (technically leaf petioles but often referred to as ‘sticks’ or 'stems') are grown as a vegetable but used mainly as a dessert. It crops over a long period, is completely hardy and grows in any garden soil. Any fertile garden soil can be used for rhubarb, as long as it is well drained and in full sun. Crowns (‘sets’) can be cropped for ten or more years, though division may be necessary after about five years. 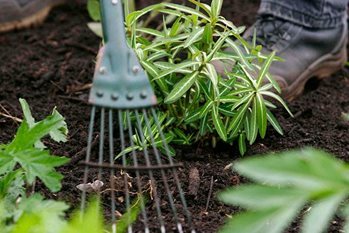 Although the large foliage can help smother weeds, the ground should be free from perennial weeds before planting. Dig in one to two bucketfuls of well-rotted organic matter, such as manure, before planting. Plant crowns in November or December. If necessary, planting can continue up to the beginning of March. Buy named cultivars, or choose a division from a strong, healthy-looking plant. Plant the crown with the growing point at, or just below, the soil surface. On wetter soils, planting with the buds just raised out of the soil may help prevent rotting. If planting more than one crown, space plants 1m (3ft) apart, with 1-2m (3-6ft) between rows. Expected yields range from 4½-13½kg (10-30lb) per 3m (10ft) row. In hot summers, if the ground becomes dry, growth will slow down and even stop. A spring mulch of well-rotted organic matter 7cm (2½in) deep will help to retain moisture, but do not bury the crowns. Plants will also respond to watering during prolonged dry periods in summer. Apply a general fertiliser such as Growmore in spring or summer at 70g per sq m (2oz per square yard). Allow the foliage to die back naturally in autumn, then cut away the old leaves to expose the growing points to winter cold. There is no harm in adding these leaves to the compost heap, as the poisonous oxalic acid contained in them breaks down during decomposition. Rhubarb requires seven to nine weeks of cold weather below 3ºC (37ºF), depending on the cultivar. Stalks can be picked from March or April onwards for early cultivars, and late April or May onwards for maincrop cultivars. Cropping of new stalks continues throughout summer, as required. The last harvest is usually in late summer, around July or August, though growth may have stopped before this if the weather is very hot. Do not harvest in the first season after planting, and harvest only lightly in the second season to avoid weakening the crowns. From seedling plants, harvest in the second season after planting or in the first season after division. Stalks should be pulled rather than cut, to prevent rotting of the remaining stump. Pull stalks when they are between 23-30cm (9in-1ft) long, holding them at the base and pulling gently outwards. Take no more than half the total stalks at any one time. Concern is sometimes expressed over the concentrations of oxalic acid building up as the season progresses. However, this build-up is mostly in the leaves which are not eaten and the amount in the stalks is not sufficient to have a toxic effect. For an early harvest of tender and pink rhubarb, cover the crowns in December or January with a layer of straw or bracken and cover over with an upturned bucket or a traditional clay rhubarb pot to exclude light. Stalks will be ready to pull two-to-three weeks earlier than uncovered crowns. Crowns that have been forced for earlier harvest should be left without pulling for the rest of that season. For an even earlier harvest, lift some roots in November. Ideally leave the lifted roots outside for up to two weeks prior to potting to expose them to more cold - this is needed to overcome dormancy. Then pot up with compost and bring into a cool room or greenhouse at a temperature of between 7-16ºC (45-60ºF). Exclude light with buckets or black polythene over crates. Keep the roots damp but not wet. Stalks can usually be harvested in five weeks. Crowns forced in this manner are usually much weakened and therefore discarded after harvest. Sow seed in spring (March/April) 2.5cm (1in) deep in a seedbed or individually in modules. If in a seedbed, thin seedlings to 15cm (6in) apart, choosing the most vigorous seedlings. The resulting plants will be more variable than named clones. Plant out in autumn or the following spring. Use a spade to divide the crown into sections each retaining a portion of the rhizome (thickened root) and at least one growing point. Sections from the outer part are better than the centres of old plants. Discard any old or decayed parts of the crown. Replant straight away, or wrap in damp sacking until ready to plant. There are plenty of good rhubarb cultivars to choose from. See Harvesting section for season of harvesting and forcing. ‘Champagne’ – a very early cultivar with long, pale pink, thin stalks. Excellent for forcing. ‘Early Cherry’ – bright reddish-pink base with red flecking on green towards top. Flesh green. Thick stalks. 'Fulton's Strawberry Surprise' – uniformly red stalks even late in the season. Performed well in flavour tests. Can be grown in large containers. 'Grandad's Favourite' AGM - very early variety. Vigorous with thick stems and good colour. Suitable for showing. ‘Hawke’s Champagne’ – even currant-red colour throughout length of stalk. Flesh pale green through to pink. Leaves heart-shaped and attractive. Vigorous. Reliable early variety. 'Reed's Early Superb' AGM - reliable maincrop variety. Suitable for showing. ‘Stein’s Champagne’ AGM - very attractive, slender, deep red stems. Dark red flesh throughout. ‘Timperley Early’ AGM – base deep red, passing to light green with red flecking. Does not hold colour well. Green flesh with reddish tinges. Heavy cropper. Good for forcing. Disappointing in Harlow Carr taste tests. Frost susceptible. ‘Victoria’ – Late, cardinal red stalks with flecking at top. Red flesh tinged green. Very thick stalks. Popular old variety. Flowering: Some cultivars can be more prone than others. Remove flower stalks as soon as they appear to prevent them weakening the crowns. Flowering is usually worse after wet summers or where high nitrogen feed has been overused. Thin, weak stalks: Lots of thin stalks indicate the crown is losing vigour and needs to be divided (see ‘Propagation’). Increased feeding may also help. Dieback of crowns: Waterlogged soils or a very wet season can cause rotting in the crown. Lift and move to a better-drained site, or incorporate plenty of gravel to improve drainage. Discard any rotting roots. Rhubarb is also susceptible to the root disease honey fungus and a bacterial crown rot. If either is suspected lift and destroy all affected crowns and replace soil before replanting.